Spring is in the air. Put away your flannel pajamas as in-house hibernation has officially ended. Glimpses of green bravely peek through the last bits of snow while a rainbow of tulips waits their turn. Spring is synonymous with cleaning. Every year the same question arises. What about us? 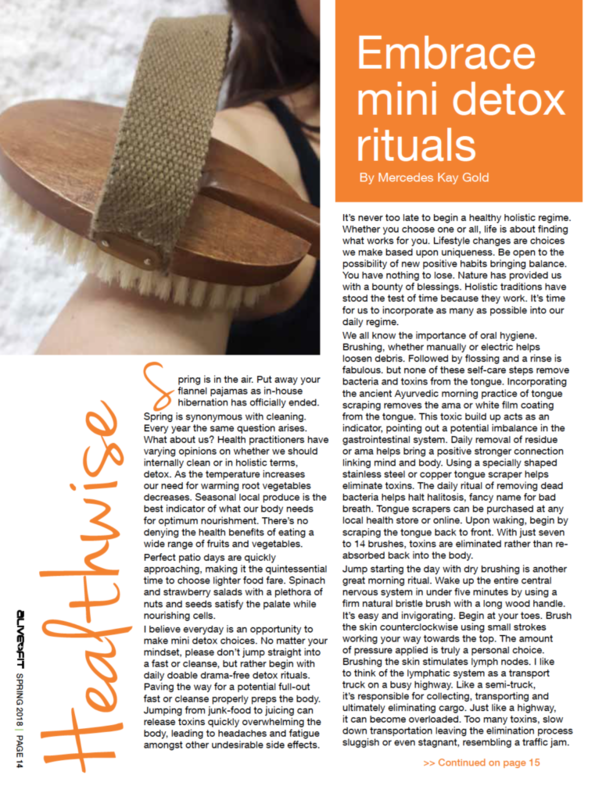 Health practitioners have varying opinions on whether we should internally clean or in holistic terms, detox. As the temperature increases our need for warming root vegetables decreases. Seasonal local produce is the best indicator of what our body needs for optimum nourishment. There’s no denying the health benefits of eating a wide range of fruits and vegetables. Perfect patio days are quickly approaching, making it the quintessential time to choose lighter food fare. Spinach and strawberry salads with a plethora of nuts and seeds satisfy the palate while nourishing cells. I believe everyday is an opportunity to make mini detox choices. No matter your mind set, please don’t jump straight into a fast or cleanse but rather begin with daily doable drama-free detox rituals. Paving the way for a potential full-out fast or cleanse properly preps the body. Jumping from junk-food to juicing can release toxins quickly overwhelming the body, leading to headaches and fatigue amongst other undesirable side effects. It’s never too late to begin a healthy holistic regime. Whether you choose one or all, life is about finding what works for you. Lifestyle changes are choices we make based upon uniqueness. Be open to the possibility of new positive habits bringing balance. You have nothing to lose. Nature has provided us with a bounty of blessings. Holistic traditions have stood the test of time because they work! It’s time for us to incorporate as many as possible into our daily regime. We all know the importance of oral hygiene. Brushing, whether manually or electric helps loosen debris. Followed by flossing and a rinse is fabulous but none of these self-care steps remove bacteria and toxins from the tongue. Incorporating the ancient Ayurvedic morning practice of tongue scraping removes the ama or white film coating from the tongue. This toxic build up acts as an indicator, pointing out a potential imbalance in the gastrointestinal system. Daily removal of residue or ama helps bring a positive stronger connection linking mind and body. Using a specially shaped stainless steel or copper tongue scraper helps eliminate toxins. Daily ritual of removing dead bacteria helps halt halitosis, fancy name for bad breath. Tongue scrapers can be purchased at any local health store or online. Upon waking, begin by scraping the tongue back to front. With just 7 to 14 brushes, toxins are eliminated rather than re-absorbed back into the body. Jump starting the day with dry brushing is another great morning ritual. Wake up the entire central nervous system in under five minutes by using a firm natural bristle brush with a long wood handle. It’s easy and invigorating. Begin at your toes. Brush the skin counterclockwise using small strokes working your way towards the top. The amount of pressure applied is truly a personal choice. Brushing the skin stimulates lymph nodes. I like to think of the lymphatic system as a transport truck on a busy highway. Like a semi-truck, it’s responsible for collecting, transporting and ultimately eliminating cargo. Just like a highway, it can become overloaded. Too many toxins, slow down transportation leaving the elimination process sluggish or even stagnant, resembling a traffic jam. Dry brushing removes dead skin, eliminates toxins and can even diminish the look of cellulite. Don’t forget it’s a dream for helping address digestive issues. Start the day with a scrub and shower. The final step should include slathering coconut oil all over your skin, the largest organ. Next up is activated charcoal. It’s all the rage on social media. Activated charcoal is not new but rather a long term remedy for detoxification. Hospitals are quick to seek its holistic binding power for countering poisoning or drug overdoses. Activated charcoal is also a gastrointestinal tract go-to. Neutralizing excessive stomach acid helps minimize the unwanted effects of ulcers. Look to it for providing relief from acid reflux. Activated charcoal also helps make bathroom sharing less socially awkward. It’s essentially the same as using an internal deodorant but along the gastrointestinal track. In simple terms, activated charcoal helps save you from embarrassing smelly gas and stools. Those suffering from diarrhea, cramps and bloating may also reap the rewards of this simple remedy. In a sugar loving society, combating candida is a common goal. Once yeast begins to die, charcoal quickly helps counter symptoms of yeast die-off. It is also linked to reducing joint pain, lowering cholesterol and anti-aging properties. Instagram is saturated with images of various brands showing this ancient detoxifying agent as today’s trend setting teeth whitener. It’s totally true! Brushing with activated charcoal is a fluoride-free holistic way to achieve a gleaming white grin. Activated charcoal changes the PH level in the mouth, helping banish bad breath. Promoting healthy gums and preventing cavities is the name of the game. Replace your standard toothpaste with a tube of uber cool activated charcoal or simply mix coconut oil and activated charcoal into a paste. Either way, you will be left with pearly whites and a black spit spattered sink! Looking for a great face mask? Skip clay and try mixing one teaspoon activated charcoal with one teaspoon of water. Apply a thin layer evenly to your face. After it dries, rinse and reveal fresh dewy skin. Just a quick note with a side of sarcasm. Charcoal should not be courtesy of the family barbecue! Please consult the label when choosing charcoal. Powders are ideal for bathroom beauty regimes while capsules are approved for internal consumption. 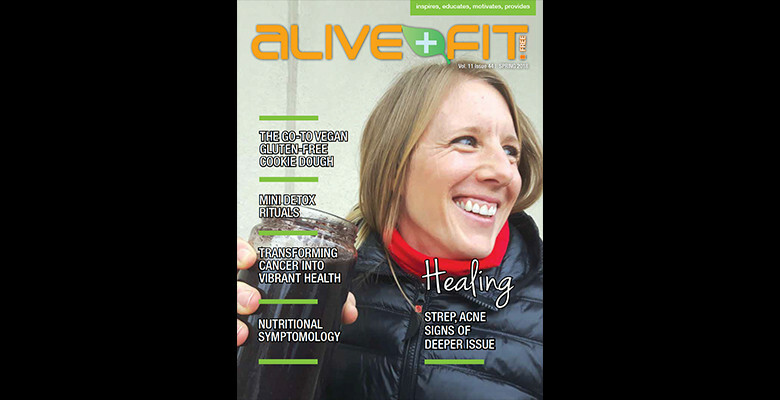 I love seeing GI supporting supplements featuring activated charcoal. Many often contain the added bonus of gut supporting ginger. Not being a pill popper, I love emptying the contents of moringa and charcoal capsules into fresh pressed juice, shake or smoothie. Move over matcha, moringa or moringa oleifero as it’s sometimes referred to, contains over 90 nutrients. Moringa’s magical flavor is reminiscent of the perfect blend of matcha and green tea. 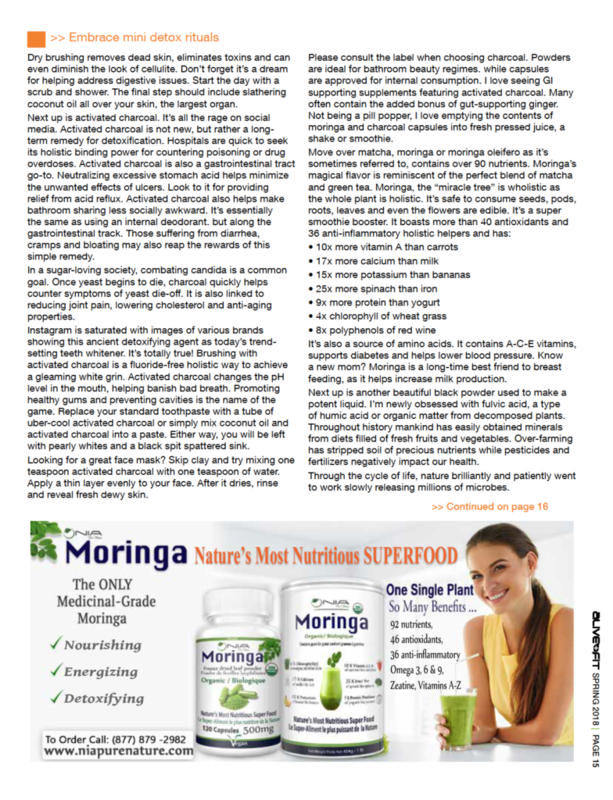 Moringa, the “miracle tree” is wholistic as the whole plant is holistic. It’s safe to consume seeds, pods, roots, leaves and even the flowers are edible. Most moringa lovers are most familiar with the gorgeous green powder derived from lush green leaves. It’s a super smoothie booster. It boasts more than 40 anti-oxidants and 36 anti-inflammatory holistic helpers. Tomorrow begin your breakfast love affair with moringa. If that’s not enough to move you to magical moringa, it’s also a source of amino acids. It conatins A-C-E vitamins, supports diabetes and helps lower blood pressure. Know a new mom? Moringa is a long time best friend to breast feeding, as it helps increase milk production. Don’t forget to look for moringa oil as a key nourishing ingredient in natural skin care lines. Next up is another beautiful black powder used to make a potent liquid. I’m newly obsessed with fulvic acid, a type of humic acid or organic matter from decomposed plants. Throughout history mankind has easily obtained minerals from diets filled of fresh fruits and vegetables. Over-farming has stripped soil of precious nutrients while pesticides and fertilizers negatively impact our health. Through the cycle of life, nature brilliantly and patiently went to work slowly releasing millions of microbes. Over time they began slowly breaking down. Because fulvic acid is the product of humification, it contains trace elements and minerals that are essential at the cell level for growth, replication and transportation. Fulvic acid is a free-radical scavenger, working hard to keep the body’s tissues and cells healthy. With a PH of 8.5, humic acid is an alkaline super power, increasing oxygen, removing acidity and in turn lowering Inflammation. Fulvic acid is an overall adaptogen or stress buster, striving for hormone balance. Even the toughest cases see improvement. In today’s toxic world, fulvic acid’s ability to bind to heavy metals is an amazing addition. In a world of on-the-go, endless energy equals endurance. Organic electrolytes found in fulvic acid also help the body maintain homeostasis or balance. As we clean out the garage, dig out bikes and dust off gardening gear, it seems only appropriate to mention mushrooms. Dating back millions of years, mushrooms, toadstools and fungi are making their mark in modern times. It goes without saying that menu planning should include an assortment of vitamin D boosting, cholesterol inhibiting and diabetes supporting portabello, crimini and shitake mushrooms. Scientists have been busy bees studying the benefits of various mushrooms. There is no disputing that medicinal mushrooms are a must for anyone serious about their well-being. The fact that they are a stand alone overall health booster is enough but knowing they are compatible with conventional medical treatments is exciting. This little known fact truly boosts confidence for those contemplating alternative treatments. You may recognize these seven super-charged marvelous mushrooms: Maitake, reishi, chaga, cordyceps, shitake, coriolus and lion’s mane. Capsules, tinctures and powders can be incorporated effortlessly into any regime. Chaga contributes to liver health. Along with being a great stress buster and reducing inflammation, chaga helps lower blood sugar. Lion’s mane supports cognitive function. Increasing mental clarity and recall make it a great addition for an aging population looking for ways to enhance their memory. Reishi is synonymous with rejuvenation. It’s a mood boosting, anti-oxidant rich mushroom helping relieve anxiety and stress. Reishi encourages sleep. Watch daytime energy soar! Reishi also supports detoxifying love to the liver and bowel. Unfortunately, many people have cancer touch their lives in some form. 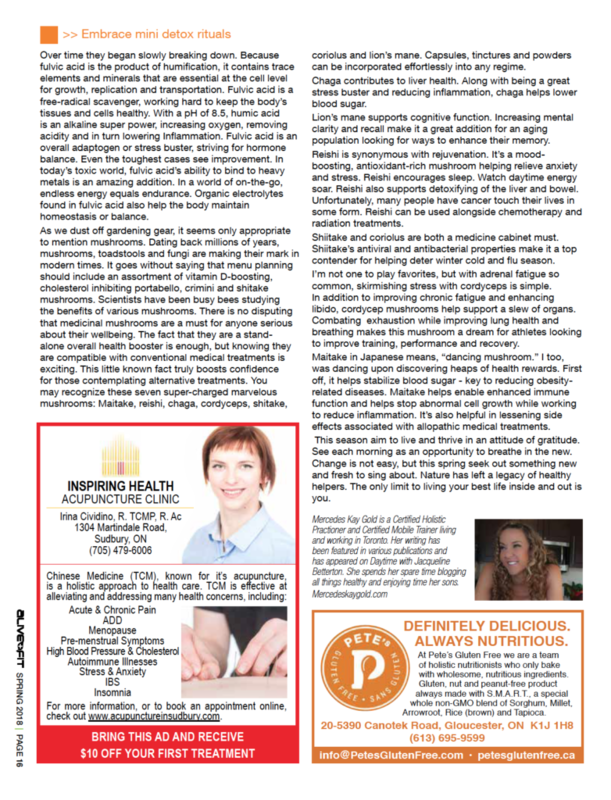 Reishi can be used alongside chemotherapy and radiation treatments. Shiitake and coriolus are both a medicine cabinet must. Shiitake’s anti-viral and anti-bacterial properties make it a top contender for helping deter winter cold and flu season. I’m not one to play favorites but with adrenal fatigue so common, skirmishing stress with cordyceps is simple. In addition to improving chronic fatigue and enhance libido, cordycep mushrooms help support a slew of organs. Combating exhaustion while improving lung health and breathing makes this marvelous mushroom a dream for athletes looking to improve training, performance and recovery. Maitake in Japanese means, “dancing mushroom”. I too, was dancing upon discovering heaps of health rewards. First off, it helps stabilize blood sugar. This is key to reducing obesity related diseases. Maitake helps enable enhanced immune function. It plays a role in stopping abnormal cell growth while working to reduce inflammation throughout the body. Maitake is also helpful in lessening side effects associated with allopathic medical treatments. The multifariousness of mushrooms makes choosing a favorite challenging. The whole lot offer holistic rewards making mushrooms paramount in any protocol. This season aim to live and thrive in an attitude of gratitude. See each morning as an opportunity to breathe in the new. Some of us find meaning in early morning meditation while some seek solace in sipping coffee. Change is not easy but this spring seek out something new and fresh to sing about! Nature has left a legacy of healthy helpers. The only limit to living your best life inside and out is you!